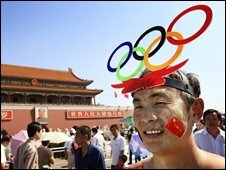 Olympic officials have denied agreeing to curbs on internet access for foreign journalists covering the Beijing Games. Reporters found a number of politically sensitive websites blocked earlier this week, and some senior Olympic officials said they had been aware of it. But International Olympic Committee (IOC) President Jacques Rogge said that there had been "no deal to accept restrictions" on access. He also praised China's organisation of the Games, which open next week. Speaking at a news conference in Beijing, Mr Rogge hailed the "excellent organisation" of the Games, saying the Olympic village was the best he had ever seen. However, he went on to say that the IOC required journalists "to have the fullest possible access to report on the Olympic Games". "I am adamant in saying there has been no deal whatsoever to accept restrictions," he added. When asked if the IOC had been naive on the internet issue, Mr Rogge said: "I would say we are idealists. Idealism is linked with some naivety." China had promised that foreign media would be given unfettered access. On Wednesday, IOC press commission chairman Kevan Gosper said he had been advised that some IOC officials "had negotiated with the Chinese that some sensitive sites would be blocked" at Olympic venues. China enforces tough internet controls, and Chinese President Hu Jintao has appealed to the international media not to "politicise" the Beijing Games. However, access restrictions appear to have been eased in recent days. Mr Rogge said on Saturday that he was pleased that journalists could now visit the BBC Mandarin website, Wikipedia and a number of websites for human rights groups. Some other sensitive sites are reported to remain unavailable. Other major concerns in the week before the Games begin have been about drug use and air quality. On Saturday, the IOC stripped gold medals from the US 4x400m men's relay team won at the Sydney Games in 2000, after sprinter Antonio Pettigrew admitted in June that he used banned substances between 1997 and 2003. The IOC was going to discuss whether to allow Greek athlete Katerina Thanou to compete at the Games, but it now seems a final decision has been delayed until next Thursday at the earliest. The sprinter pulled out of the Athens Olympics in 2004 after failing to report for a drugs test. She was banned for two years after missing her third test, but is now in Greece's athletic team for this year's Games and has threatened to sue Mr Rogge if she is barred from Beijing. 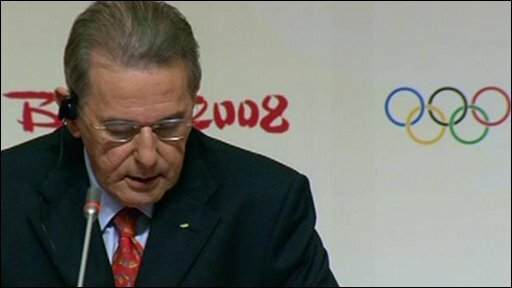 Mr Rogge said a recent increase in positive drugs tests ahead of the Games was the result of a deliberate IOC policy. He said 17 athletes had tested positive in the lead up to the Games. "This is the result of a deliberate strategy and policy. These are 17 cheats who will not falsify the competition," he said. Air pollution remains another big worry, although the skies over Beijing on Saturday were clear. The Chinese authorities have been working on improving the dirty air that hangs over Beijing, but athletes remain concerned. Steve Roush, head of sports performance with the US team, said he was monitoring the situation and was optimistic. "We do have fallback plans if all of a sudden it deteriorates to the point where the health and safety of our athletes might be in jeopardy," he said. "But I don't think that if the air quality was at that level that the IOC would even allow for the competition to take place."